OOOh, there is just so much going on at one time. Dr. Kabot and I are hopefully finishing our final edit on our data collection book which is keeping me pretty busy. I hope it will be out this summer. Plus, we are coming up on April, Autism Awareness (and Acceptance) month. We have a few great things lined up with some friends that I will share on Wednesday. I will have some link ups of free autism products and some other surprises, so stay tuned. In the meantime, if you are looking for ways to help build awareness and acceptance, check out last year’s freebies for Facebook cover pages and profile pictures HERE. Following up on the last post about presenting instructions to students in DTT, I wanted to share some of the things that we have found that contribute to the effectiveness of DTT (and any type of instruction). You can follow all the steps but it’s also the quality with which the instruction is delivered that makes a difference as to what the student really learns. As I mentioned last time, part of it is what we say (and how we say it) and part of it is the material presentation. I’m going to focus on what we say and how we say it first beginning with 5 things we DON’T want to do…starting with SD Voice. Right now you are either saying, “Yes!” or “What is that?” Mary Jane Weiss coined this term (or at least that was where I heard it first) in a talk she gave and it immediately rang a bell for me because I’ve heard it (and used it) before. SD voice is when your voice has a specific intonation and cadence when you present instructions. Usually that intonation does not match the way you usually talk. Many times you have a higher pitch to your voice, or drop the end of the sentence, or a sing-song type of cadence. SD voice gives false cues about the instruction, and the instruction that uses it doesn’t get generalized as well because it doesn’t sound like the way people talk in the “real world.” [This is much easier to explain in training than in writing.] Try to keep your voice tone and cadence similar to how you would present the direction at any time. I touched on this in the last post, but you want to keep your words short and focus just on the relevant information. Learners with autism and/or language issues, have difficulty filtering out what is important to listen to (or look at) and what is not important. It’s called stimulus overselectivity and it interferes with the learning of many of our students. Keeping our instructions brief and clear is a way keep from giving interfering cues. I will talk about this more when I talk about materials, but DTT, by its nature, limits the world to keep it simple. The drawback is that it doesn’t generalize to the non-DTT-world well without specific instruction outside of the limited DTT world. However, we can save ourselves and our learners some time by trying to make sure our directions make sense in the real world. Here’s one of the best examples of unreal directions that I say all the time. “Katie, what’s your name?” Um, I just called her by her name! DUH! Then I realize I have to scrap that trial because no one will ever ask for the information of her name and use her name in the instruction! Part of this will play a role in developing the instructional programs, but part of it happens because we are distracted and get caught up in our own little world and forget that the world doesn’t sound like this. I talked about not teaching “look at me” anymore HERE and the reasons are similar. It doesn’t fit the outside world. So keep the directions real! This is another one that is easy to do. We give the direction and forget to make sure that the learner is attending to us and the materials. It’s critical that we make sure that the person is attending to us before we tell them what to do, or we won’t know whether they didn’t do it because they didn’t know they should or because they hadn’t learned it. It’s a good example of when the mistake being made is the adult’s, not the student’s. We are so quick to blame the student for poor learning, but first we always have to look to ourselves. Another easy one to do and one you may not be aware you are doing. Many times, our facial expressions, body movements, words, and presentation of materials give away the answer to the student. Because of stimulus overselectivity, the student focuses on where your hand is or whether you are smiling rather than whether that picture is a cat or a dog. This is going to be the focus of the next post in the series and I will share a number of different things to look for that might be sabotaging your instructions. In the meantime, think about having someone watch you (or videotape yourself) to see if there are cues you aren’t aware of that are giving you away. Do you have stories about discovering that you (or someone you were watching) was giving away the answer? Share it in the comments! 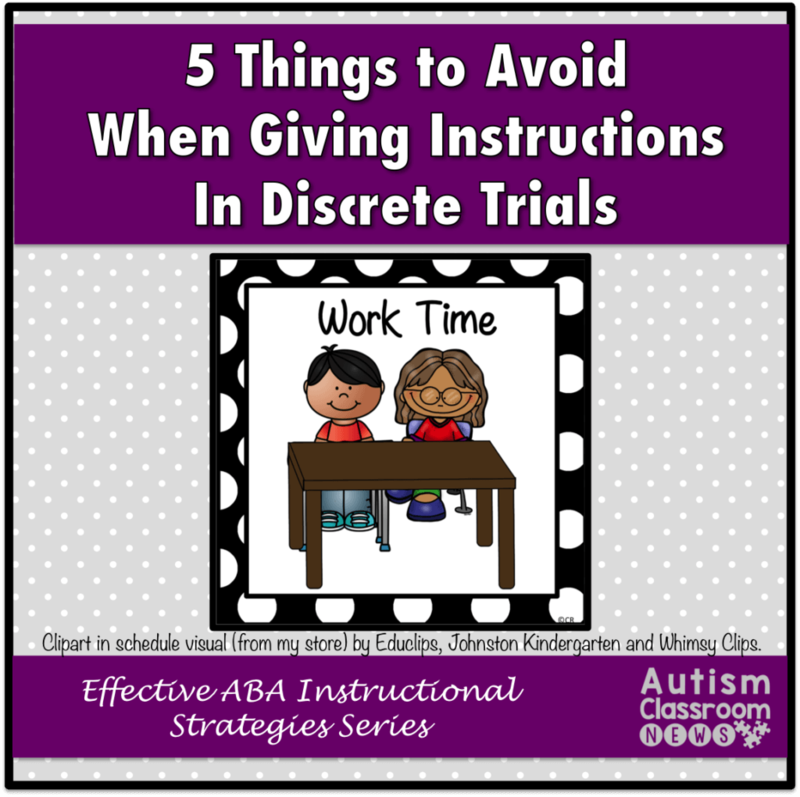 My next post will be Workbasket Wednesday followed by some Autism Awareness and Acceptance fun and then I’ll be back to talk more about instruction. « Presenting Instructions in Discrete Trials: What Makes a Quality SD? Awesome post!! I can apply these ideas to asking questions of a whole group in a learning support or inclusion classroom, as well. They're great questioning tips. Thanks! I am loving this series! While I prepare to begin graduate course work in sp.ed. this Autumn, I am voraciously learning everything I can about educating students with Autism and ABA strategies (I hope to sit for the BCBA exam once finished with grad school). This series has been so wonderful! I've even learned strategies to use with my current, typically developing toddler students. Thank you and I'll look forward to the next installment! Thank you Lyssa! That's great that you are going for the BCBA!! Good luck with your studies and if there is any questions you'd like to to address in the series, be sure to let me know!